Marco Valerio, frontman for QuadJacks who after leaving for a stint with the Global Poker Index has recently returned to revive QJ in time for the upcoming World Series of Poker, has penned an interesting article for the May issue of Two Plus Two Magazine. The article is titled “The Poker Community versus the Poker Public,” and among the topics addressed is the distinction between the two groups identified in the title. 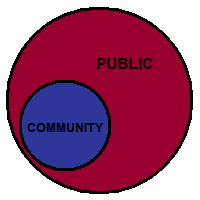 He then discusses the “poker public” as a larger group of which the “poker community” might be understood as a subset, encompassing people who aren’t necessarily living and breathing poker the way the “poker community” often does. Some play, but not all do, as there are some in this larger group who are content merely to watch others play on television or in person. All, however, are interested in poker in some fashion. Valerio ultimately offers advice to all regarding the significance of this distinction, in particular directing his comments to those working in various poker-related industries (esp. online poker) who have a vested interest in trying to attract members of the “poker public” into the “poker community” as players. The article reminded me of various debates that have popped up before over recent years, including some of those “Is it good for poker?” discussions focused on moments when poker occasionally earns brief attention from so-called “mainstream” popular culture. A reference by Valerio to Two Plus Two’s central place in the “poker community” also made me think of a post I wrote here a couple of years ago “On Poker Communities” that overlaps a little with some of what he discusses. However, a lot of my thoughts after reading the article centered around the experience of teaching my “Poker in American Film and Culture” class for the past couple of years, one consequence of which has been being frequently forced to think about the larger “poker public” Valerio describes. Most (not all) who sign up for the course have at least some interest in poker, with a few being players themselves. Readers of this blog -- most of whom are probably best considered part of the “poker community” Valerio is describing -- might be surprised to learn that very few among those who take my class play poker regularly, let alone are as serious about the game as most of us are. And I even have a few take the class who have never even thought much about poker before at all, let alone played. It might have been different if were teaching the class a few years ago. Black Friday happened during the first semester I taught the course (spring 2011). I know I had quite a few online poker players enrolled in that first installment of the class, but obviously the situation has changed since then. These days there are usually only a few who take the class each time around whom I’d unequivocally peg as coming from the “poker community” group. In any case, talking with groups of people who mostly belong to that “poker public” about poker and its place in American culture has forced me to think a lot about how people outside of our “poker community” view the game and its significance. Often there are some great differences between how the two groups think of poker, the most conspicuous usually being the way the “poker public” views poker as essentially just another gambling game while those in the “poker community” often consider poker as something much different. Being the teacher in this dynamic, I guess I’m also quite conscious of how those in the “poker community” sometimes recognize a need to educate the “poker public” about certain important elements of the game (including its skill component). But I’m also aware that I often learn a lot from my students, too, regarding the topics we discuss, and thus can say from experience that the “poker public” can teach the “poker community” a lot, too.